Many people believe that happiness can be bought or that material things can fill the empty voids everyone at some point in life encounters. For example, many of us seek out to acquire large houses that end up bringing with them a heavy mortgage. One day, I asked myself, “Is being stuck in a house that has only brought me debt, my true path to happiness?” In my case and many of those who purchase the famous mini campers have found that owning a home is not the ideal path. These days I rely on my own mini camper and I can say that it has been a unique experience due to one of the most important reasons which are that it has saved my pocket a lot of pain in a very outstanding way. The happiness found by living in mini campers creates the mental concept of being able to face any challenge one might encounter due to the space made available within the camper that is fully taking advantage of each one of its square inches, as opposed to misuse of the same spaces which is very common amongst larger trailers. These campers are usually enjoyed 100%! The mini camper is an essential tool to face trips of many mileage with heavy climate changes since in their majority the materials with which they are built protect from the sun, rain, and strong winds. These mini campers are used not only to live, many people use them to transport objects or for camping which is its most common use in North America because of its lightweight design which allows for it to be transported in a very simple fashion, and it is not necessary to rely on a high cylinder motor. Being able to take everything necessary to survive in nature without having to carry it on your back but instead being able to carry it by your trailer or vehicle is what makes many nature lovers desire the purchase of one of these mini campers. Getting away from the city as mentioned previously is one of the main reasons for which you should acquire a mini camper while keeping in mind that you can count on elevated prices for small homes when it comes to buying a property, whether it’s a house or an apartment. So, be careful, these can’t be transported around like as opposed to the mini campers. For people that love to personalize their homes and things to their own liking, the mini camper also allows that possibility since it allows various kinds of wallpapers to be added to its interior as well as a change in the furniture since it comes with removable covers that can be styled to your liking. This all serves to generate an atmosphere that is pleasurable, authentic, and sophisticated according to each person’s taste. 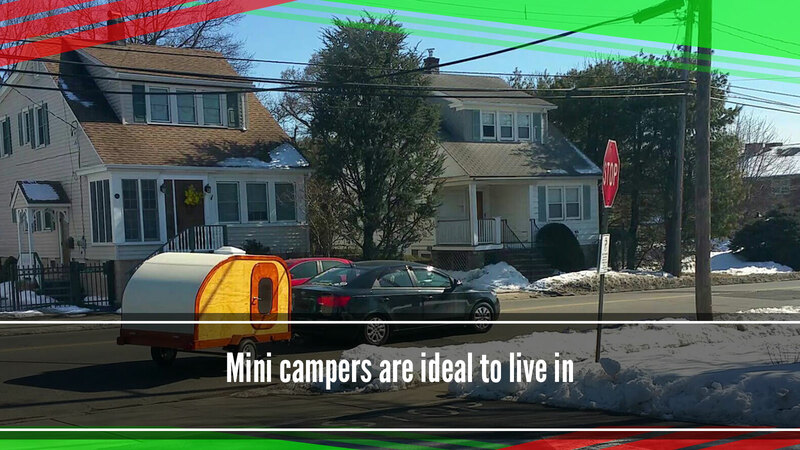 While keeping everything said in mind, it’s not left without saying that mini campers can usually be ideal to live. Not only for that but to travel with family to enjoy a weekend in the midst of nature with all of the basic and most needed commodities.